An Orbital Sciences Corp. Antares rocket is seen on launch Pad-0A at NASA's Wallops Flight Facility on Jan. 6, 2014 in advance of a planned Jan. 8 launch in Wallops Island, Va. The mission will launch Orbital's first Cygnus cargo mission to the space station. WALLOPS ISLAND, Va. — A privately built robotic spacecraft is poised to blast off from Virginia's freezing cold Eastern Shore today (Jan. 8) on a debut delivery flight to the International Space Station, and you can watch it live online. The commercial spaceflight company Orbital Sciences will launch its first Cygnus cargo mission from a pad here at NASA's Wallops Flight Facility at 1:32 p.m. EDT (1832 GMT) to deliver more than a ton of supplies for astronauts in orbit. The spacecraft will launch atop a commercial Antares rocket, also built by Orbital Sciences. The unmanned Cygnus spacecraft is packed with 2,780 pounds (1,260 kilograms) of gear for the International Space Station, including a space ant colony, 33 small cubesat satellites and 23 other experiments designed students from across the country. More than 10,000 students will ultimately be involved in the experiments, NASA officials said. If all goes well, the Cygnus spacecraft is expected to arrive at the space station on Sunday (Jan. 12), where it will be captured by astronauts using the outpost's robotic arm. The mission — called Orb-1 — is Orbital Sciences' first official Cygnus delivery missions to the station for NASA under a $1.9 billion cargo contract. The company plans to launch eight resupply flights in all. "This will be the first of three contracted cargo delivery missions for us this year," Orbital Sciences executive vice president Frank Culbertson, a former NASA astronaut, told reporters Tuesday. Orbital initially planned to launch today's Cygnus mission in mid-December, but postponed the flight to allow astronauts on the station time to complete emergency spacewalk repairs to the outpost's cooling system. A Jan. 7 launch target was also delayed due to extremely cold temperatures. This NASA image depicts the visibility range along the U.S. East Coast for the launch of an Orbital Sciences Corp. Antares rocket launching Jan. 9, 2014 from NASA's Wallops Flight Facility on Wallops Island, Va. Depending on your viewing location, the launch may be visible low over the horizon, reaching an altitude of 5 and 25 degrees up in the sky. (Your closed fist held out at arm's length covers about 10 degrees of the sky). "Viewers all along the East Coast there will have a chance to catch a glimpse of it in the sky when we do launch in the afternoon," said NASA's Wallops test director Sarah Daugherty in a prelaunch press conference. A viewing location with a horizon clear of trees or high buildings is recommended. Viewing maps provided by Orbital Sciences suggest the launch could be visible from as far north as Boston, Mass., and northern South Carolina in the south, and reach inland to parts of West Virginia. Observers north of the Wallops Island, Va., launch site should look toward the south, while viewers in southeastern Virginia and South Carolina should look toward the north. Editor's note: If you have snap an amazing photo of the Antares/Cygnus launch today and would like to share it with SPACE.com for a possible story or gallery, send images and comments in to spacephotos@space.com. Daugherty said there is a 95-percent chance of good weather for today's launch attempt despite the freezing cold. Temperatures are expected to be in the low 30s Fahrenheit, but otherwise clear. Orbital Sciences officials say the Antares rocket is designed to launch in temperatures as low as 20 degrees F (minus 6 degrees Celsius). Dan Hartman, NASA's deputy space station program manager, told reporters that the agency is tracking the solar storm. "The radiation looks good right now, so so far we're not tracking any problems with that," he said. Orbital Sciences' Cygnus spacecraft are cylindrical vehicles designed to carry payloads of up to 4,400 lbs. (2,000 kg) to the International Space Station. The bus-size spacecraft are 17 feet long (5 meters) and are made up of a pressurized compartment built by Italian aerospace company Thales Alenia Space and an Orbital-built service module housing the vehicle's thrusters and solar arrays. The Antares rocket launching Cygnus will lift off from Pad-0A at NASA's Wallops Flight Facility. The pad is overseen by Virginia's commercial Mid-Atlantic Regional Spaceport. An Orbital Sciences Corp. Antares rocket is seen as it is rolled out to launch Pad-0A at NASA's Wallops Flight Facility, Sunday, Jan. 5, 2014 for a planned Jan. 8 launch from Wallops Island, Va. The Antares will launch a Cygnus spacecraft on a cargo resupply mission to the International Space Station. Orbital is one of two commercial companies tapped by NASA to use robotic spacecraft to keep the International Space Station stocked with supplies. The other company is Space Exploration Technologies (better known as SpaceX) of Hawthorne, Calif., which has already launched two delivery missions to the station for NASA under a $1.6 billion deal. SpaceX is expected to launch its third of 12 planned missions for NASA on Feb. 22, Hartman said. 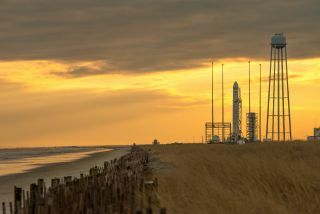 Orbital Sciences, meanwhile, launched its first Antares rocket in an April 2013 test flight that was followed four months later by a successful Cygnus demonstration mission. Visit SPACE.com today for complete coverage of Orbital Sciences' Cygnus cargo launch to the International Space Station. SPACE.com partner Spaceflight Now is also offering updates via its Cygnus Mission Status Center.